History is getting back in gear. Recently, the network announced Top Gear will return this month alongside the premiere of new series Car Hunters. 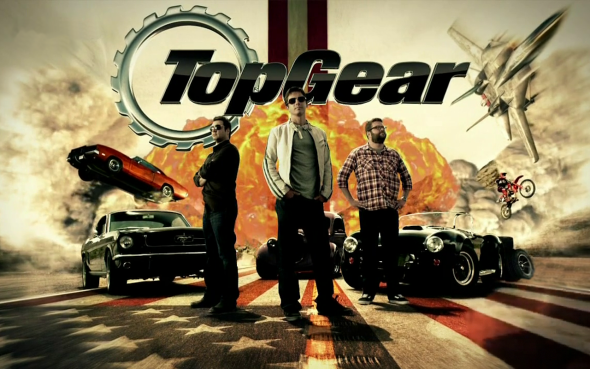 Not to be confused with the original BBC series, History’s Top Gear features hosts Tanner Foust, Adam Ferrara, and Rutledge Wood discussing and driving a wide range of motor vehicles. Season six of Top Gear premieres on April 26th at 9 p.m. ET/PT. New York, NY – April 7, 2016 – HISTORY’s enormously popular series “Top Gear” returns Tuesday, April 26 at 9 PM ET/PT for an all-new trailblazing season featuring exotic supercars, extreme stunts and over-the-top challenges. Immediately following at 10 PM ET/PT is the brand new 16 episode half-hour series “Car Hunters,” which follows individuals as they passionately search for their dream car. In this season of “Top Gear,” Tanner Foust, Adam Ferrara and Rutledge Wood pull out all the stops exploring all things automobile, and taking on challenges that have never been done before. Whether it’s being the first people to photo map the legendary Rubicon Trail, or the first Americans to legally drag race in Cuba in a half century, they push the boundaries of what can be done on four wheels. They’ll also attempt to build the perfect postal delivery vehicle, train in war games with the U.S. Army, and compete in a grueling 24 hour endurance race. Tanner, Adam and Rutledge, along with The Stig, crisscross the world from Sweden to Cuba, from the Rocky Mountains to the Mojave Desert, driving some of the most cutting edge vehicles the automotive industry has to offer, including the Koenigsegg One:1, the Tesla model S P90D, and the 2016 Dodge Viper ACR, in the most original and ground-breaking season of “Top Gear” yet. The brand new series “Car Hunters” follows individuals as they search to buy their dream car. In each episode we follow a new buyer, aided by a friend or family member, as they check out three unique vehicles and hit the open road for a test drive. We share in the exhilaration and deliberation as they try to decide which ride they will cruise home in. Featured buyers include an empty nester who wants to recapture his youth with a car from his glory days; a father and son duo who are on the hunt for a thrill ride to bond over; a former correctional officer looking to kick off his retirement in style by owning a classic convertible; and a life-long lover of iconic low-riders who’s looking to finally buy one of his own. “Top Gear” is produced for HISTORY by BBC Worldwide Productions and is a co-production between HISTORY and BBC Worldwide Productions. Patrick Costello, Nat Grouille and Travis Shakespeare serve as executive producers for BBC Worldwide Productions. Executive producers for HISTORY are Russ McCarroll and Jim Pasquarella. What do you think? Do you watch the American Top Gear? Will you watch the premiere of Car Hunters? More about: History TV shows: canceled or renewed?, Top Gear, Top Gear (US), Top Gear (US): canceled or renewed?, Top Gear: canceled or renewed? I was so excited you featured a Studebaker this week, until the salesman was allowed to incorrectly state that they bought parts from Ford. Never happened. You are the History Channel and owe it to your viewers to check your facts.